Do you have Scottish chinchilla cats in your cattery? The Scottish cat breed has won the hearts of hundreds of thousands of people a long time ago! Some of them even decided to devote their lives to working with this spectacular breed! Today, Russia has many decent catteries that have high-quality and competitive animals. Russian cats regularly become winners of not only domestic but also foreign cat shows. Lead the world rankings and confirm their "top show" quality! It should be noted that the work of Russian breeders never stands still. If we talk specifically about our breed, over the past few years there has been a real breakthrough in the development of the breed! In social networks you can often find messages about getting kittens of unique, previously non-existing, variations of colors. It is also worth noting that the type of animals, in general, also improved significantly. Professional breeders also do not forget about the health of their pets! In confirmation of my words I would like to give a video in which you can see our cat ROYAL STAR LEXUS and to hear the opinion of the President of the International Felinological Association (MFA) Shevchenko Elena Alekseevna on Russian Scottish Folds. In the video, the expert says that many well-known foreign Scottish Fold catteries buy their producers in Russia, since, according to the expert, Russian breeders have created an excellent population of Scottish folds and Scottish Straights! I will begin by saying that every animal of our cattery always returns home from any international cat show with excellent descriptions and grades. They also regularly become prize-winners of various rings, nominees and winners of the Best in Shov competition. But, as it is considered, the work of the cattery should be evaluated by its breeding results, that is, by the quality and success of the offspring received. As I said above, our cattery is quite young, so at the time of this writing we only had 3 litters of Scottish kittens. 2 of them are still small kittens, which are not even ready to move to a new home and, therefore, are not yet able to participate in international cat shows. We will look at their results a bit later! I am sure that they will still delight us with great news not only from Russian but also from foreign cat shows (several kittens are reserved by people from the USA and Canada). But now I can already tell you about the first results of our first litter (sorry for the tautology) 🙂 AlvaRoss Arnold - Scottish Straight male kitten of black golden ticked (ny 25) color at his first show at the age of only 5 months received two title evaluations (CACK), was both days nominated for the final contest of the best cats of the show - Best in Show and... on the second day of the show he became not only the best male kitten, but won in comparison with the best female kitten! He became BEST KITTEN (the best kitten of the show)! At the next show, his brother joined him - AlvaRoss Alex. Both kittens took part in the SFS-SCS congress, according to the results of which both kittens entered the TOP-5 best representatives of this breed! Alex took the 4th place, slightly losing to his brother, who entered the top three, receiving the "bronze" - 3rd place! Excellent results for this age! Dear Colleagues! I know firsthand how difficult and responsible our work is! After all, we are responsible not only for cats, but also for the breed as a whole. Therefore, I have great respect for your work! I can not describe in words how beautiful it is to be part of a large community united by the love of cats! I think that you will agree with me that successful breeding work is impossible without interaction with other breeders. "Why is that?" - may ask a site visitor. First, in order for kittens to be born, you must first acquire their parents. Every cattery owner faces this, because he, too, once bought his first producers from other breeders. Secondly, the development of the breed is impossible without the addition of new breeding blood. And this, again, additional interactions with other breeders. Sometimes, to buy a quality animal with the right of breeding, you have to make long negotiations about the purchase or even wait for the birth of this kitten for a long period of time. 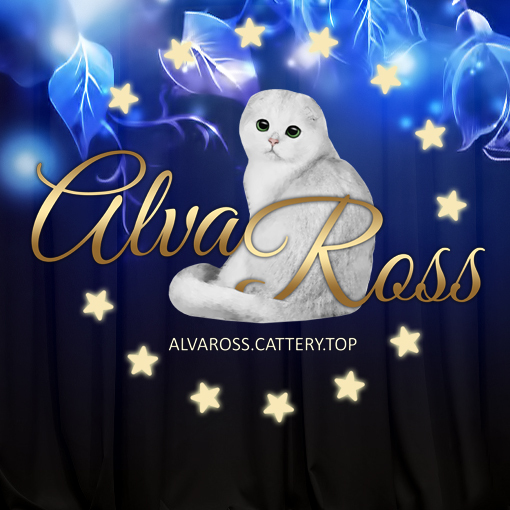 I am ready to place information about your nurseries both on the specially created page “Friends and Partners of AlvaRoss cattery” and on this page in this section. On the issue of placing information about your Scottish cats catteries write me through the contact form on my site. Information about your cattery will be posted in this section, which is called “Elite Scottish Cats Catteries in Russia”. Scottish Cats cattery in Russia, in Volgograd - AlvaRoss. If a lot of fold-eared kittens are born in your Scottish cats cattery, you can also place information about your Scottish Cats cattery on one more page of my site. On my site there is another section "Scottish Fold Catteries of Russia". If you are interested in placing an active link to your cattery site, then I invite you to exchange partner links! In this case, information about your Scottish cats cattery website will be posted in the section “Friends and Partners of AlvaRoss cattery” website. On our site there is a section "Kittens of our friends". I am ready to place information about your available kittens on the pages of my site. What do you need to do to your kittens were published for sale on my site? On the phone or in letters, we will discuss the terms of cooperation with you. Send me a photo and information about your kitten, and also indicate the price for which you want to sell your Scottish kitten. Are you a professional breeder and do you currently have silver chinchilla kittens for sale? I suggest you not only add your Scottish chinchilla cats cattery to the sections described above, but also to place information about the available kittens. As I have repeatedly written above and on other pages of the site of our cattery, we have a special section called “Kittens of our friends”. I think that people who are now looking for exactly a kitten of this color will certainly look at this page! Why should I post information about other kittens on my website? I am ready to place information about the sale of your kittens on the pages of my site. What do you need to do to make your kittens be published as available for sale on my website? Send me a photo and detailed information about your kitten (gender, ear type, breeding class, parents) and also indicate the price for which you want to sell your Scottish kitten.